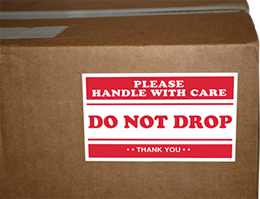 Bold and tear-proof Do Not Drop Shipping Labels warn carriers that your box needs a little extra care. A simple Do Not Drop message works as 3 warning messages: Keep Upright, Do Not Drop, and Handle with Care, all in one. • Alert package handlers of your shipping requirements. • Bold red and white labels are attractive and hard to miss. • Backed with an aggressive acrylic adhesive. • Do Not Drop Shipping Labels come in rolls of 500. Order a label dispenser separately, so labels are even easier to handle. Device shows if package is dropped in transit. Protect fragile shipments!